Karazzim is the location of the Kobold Headhunters campaign. It is often confused with other uses of the word, such as Romulus' Grandfather. Inside a cave of Kobold Mountains/Mt. Kobold. It is known to have a shrine for a master monk kobold. Caves of Kobold Mountains/Mt. Kobold. 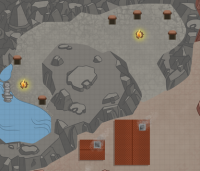 Location for Temple Of The Monks and a shrine for a master monk kobold. Kobolds are not known for their wits. However, this has not stopped them from trying to be like other races, and inventing their own language. But due to their lack of overall intelligence, Kobolds resort to simply using four or five words to describe everything. The most famous of which is the name of their species (Kobold) and the second most well known being Karazzim. In this campaign, Karazzim is home to many Kobolds. These Kobolds spend their days farming and ranching Rock Sheep. The town of Karazzim is located at the base of the Karrazzim mountain range and the Karrazzim Monastery. The town is constantly struggling to defend itself from wolves eating their Rock Sheep and Goblin bandits invading. The region of Karazzim is mentioned in passing by Gwyneth while stating that Elves, being the dominant race, must take care of the other, lesser races. She claims that the region was savage and uncivil before the Elves came in and put it right. It is unknown whether the events she is talking about took place before or after the events of Kobold Headhunters. The word Karazzim is mistaken for the place Karazzim, people whose name is Karazzim like Karazim or Karazim and carazim the emotion to Non-Kobold. There are many Kobold locations named Karazzim. This page was last modified on 24 July 2017, at 15:10.